Today, post number seven of my 12 Posts of Christmas, is all about sweet memories. Hopefully they will "burn bright" this Friday the 13th. This is the coldest morning we've had since the dead of last winter. It's about -14°C. Brrr. We may not be able to physically relive our memories, but we can certainly trigger them by our actions. Often that is via food. These cookies remind me of my mother, father and sister, and growing up on the South Shore of Nova Scotia. We used to go grocery shopping on Fridays in Liverpool. There was a bakery on Market Street called Semone's Bakery. It was "the" bakery in Liverpool. It was in an old Victorian storefront with wide glass windows and a recessed entry. When you opened the door you were surrounded by glass-faced counters on three sides, filled with all manner of homemade breads, rolls and sweets. 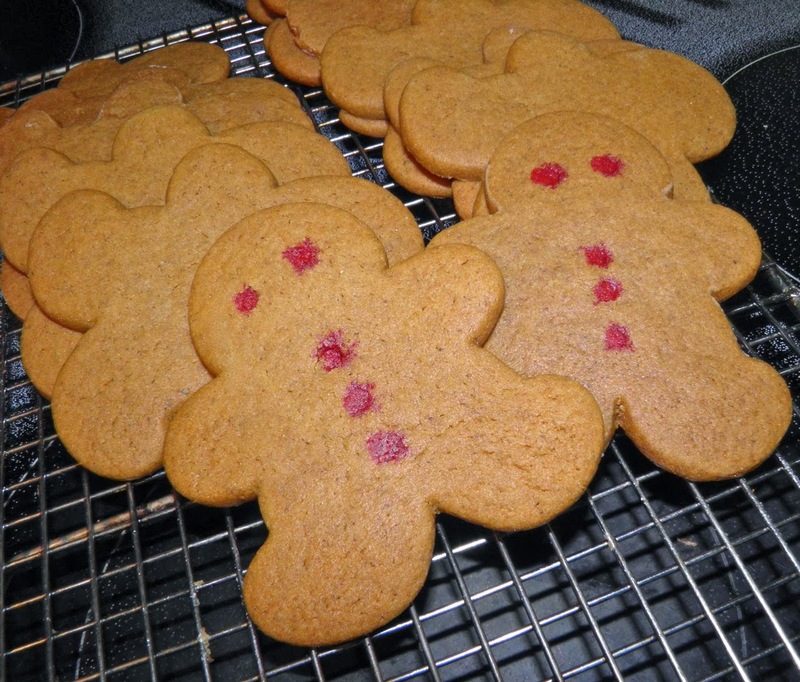 Three treats that I remember are the fantastic “egg tarts,” sugar cookies and these delicious little men. 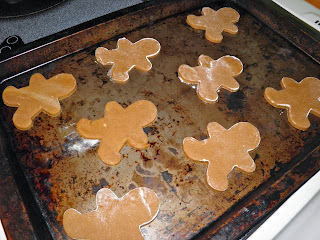 The gingerbread men stood out because they had no fancy decoration. The eyes and buttons were nothing more than red food colouring. But in our eyes they were decorated with gold. They were large, too, standing at at about 6" tall. Slightly firm and slightly spicy, they were a treat for us on the drive home, if we were good while Mom and dad were shopping. We had to have something to occupy us on the half hour drive. The bakery and its recipes are long gone, but the happy memory remains. Baking these cookies is a way for me to reconnect with happy times gone by. Successful gifting is all about giving to someone what they would not give themselves, but would appreciate. Think of the joy you can give with a dozen gingerbread men in a small basket or in cellophane bags tied with ribbon? Although perfect as a Christmas gift, these gingerbread men will be sure to make wonderful memories any time of the year. 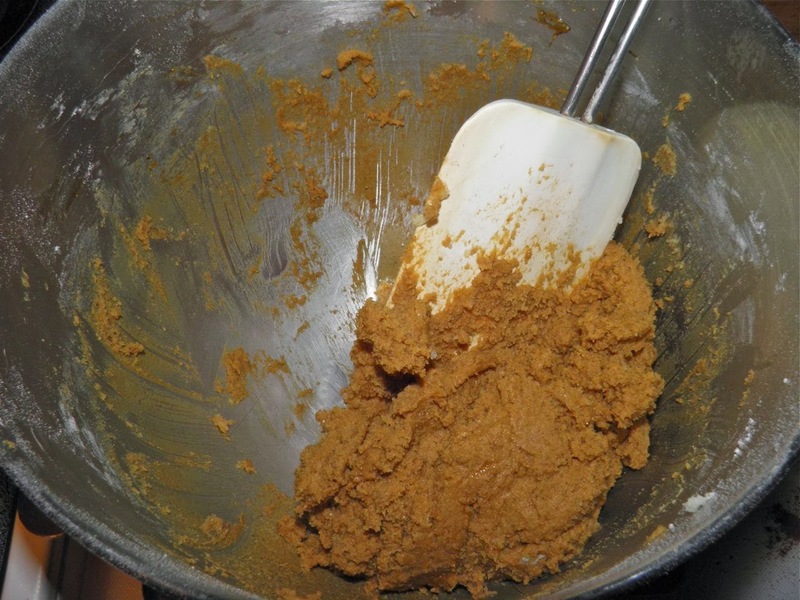 Cream the butter and sugar together in a large mixing bowl. Add the molasses and egg and beat again. Next add the salt, baking powder, baking soda and all the spices. Stir to combine. Add the flour, one cup at a time, beating it in well after each addition. Scrape all the dough onto some plastic wrap and refrigerate for at least one hour, or overnight. Preheat the oven to 350°F. Dust a rolling board with flour. 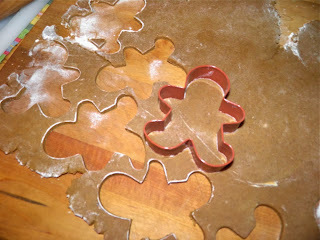 Roll the chilled dough out to about 1/4” thickness and cut out with a cookie cutter. Arrange on a baking sheet, with a little space in between. The cookies will spread slightly. Bake for 10 minutes. Remove from the oven and let sit on the tray for 2 minutes, then remove to a rack. Do not stack the cookies while warm or they may stick together. In a few minutes the cookies will firm up. 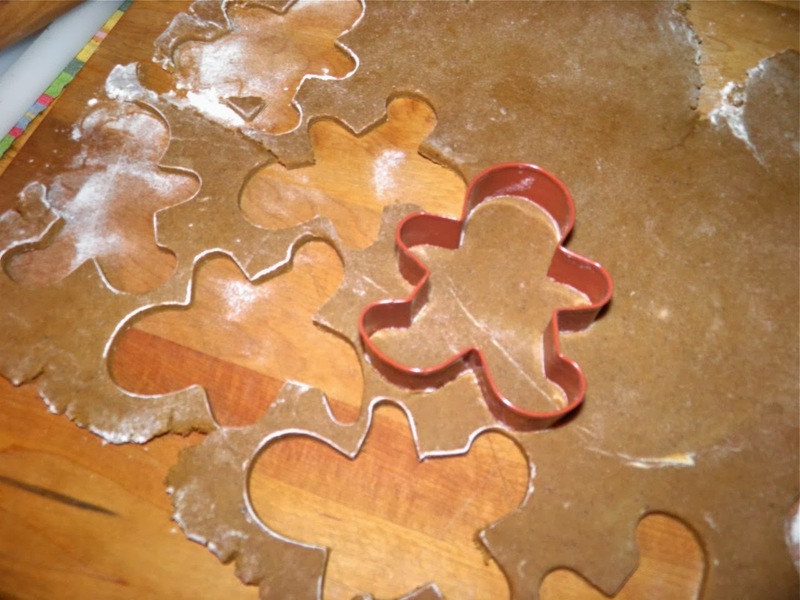 Bring any remaining dough together, re-roll and cut until all the dough is used. To decorate add 3 drops of red food colouring to 1 tablespoon of water. Dot the cookies with a small paint brush for eyes and buttons.